Smallholder woodlots are a key local source for tree products, and they are expanding rapidly in East Africa. Niwaeli asks where the woodlots are located, and how much area they cover in South and Eastern Tanzania. Her work will quantify the contribution of smallholders to planted forests, and inform policies that have to balance tree farming against other land uses. Niwaeli’s interest in smallholder woodlots started when she was conducting her Master’s research in Tanzania, at the southern end of the East African Rift. She saw rural farmers planting pine and eucalyptus in farms that are located near a forest edge on land that had been fallow for 15 years. Her collaborators, working at another forest edge site in the Uganda portion of the Rift, were noticing a similar conversion from cropland to tree plantations. She wanted to know how much smallholder tree planting was occurring near Rift forests, and why. Niwaeli used Google Earth to get a first impression of the distribution of woodlots. She randomly selected 60 locations in a small portion of the Rift, and digitized all the woodlots in the area. So far the team has digitized more than 4000 individual woodlots. “The really striking thing is how small these woodlots are: 93% are less than 1 hectare, and the average area is 0.45 hectares”, she said. Niwaeli extrapolated the area of woodlots she found in the digitized subset to the entire Tanzanian Southern Highlands area and estimated 80.000 ha of smallholder woodlots. That does not sound like a big number, however, it is only ~ 10.000 ha less than the amount held by the biggest tree plantation owner, the Tanzanian government. A big question remains though: Why would a subsistence farmer plant trees with a slow turnaround rate, instead of growing food crops? A Google Earth view showing woodlot patches (orange outlines) mixed with other land uses away from the forest edge. In contrast to the US where farmers tend to own large and contiguous fields, in Niwaeli’s study site, farmers tend to own multiple small parcels of land that are spread throughout the landscape. Niwaeli thinks that the farmers make some allocation choices about which pieces of land will have crops, and which ones will have trees. She assumes that those parcels that are closer to the edge of the forests are not that great for growing food crops and are used for planting trees if the farmer can grow food somewhere else. “This could explain our initial field observations where we saw trees near forest edges” she added. 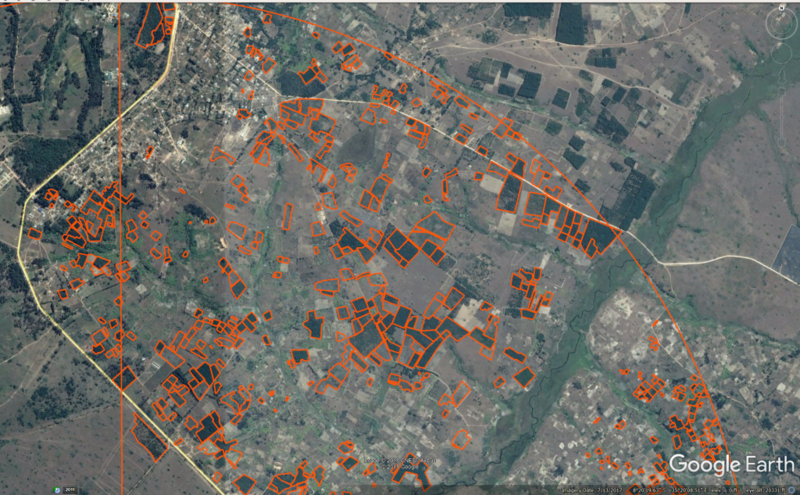 From the digitization, however, Niwaeli has seen that the woodlots are not limited to just forest edges, so the question of how farmers allocate land to trees is yet to be fully answered. She plans to further investigate the spatial distribution of tree plantations by mapping woodlots using Sentinel-2 satellite imagery. This will also provide a more accurate quantification of woodlot extent; and allow her to explore why some areas end up with woodlots while others do not.